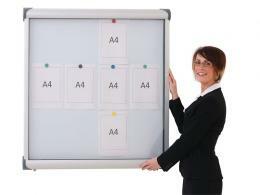 Noticeboards can fulfil a variety of functions in any office, school, business, or general work environment. They’re a place to post notices, announcements, instructions, memos, and more. A large board in your office will encourage communication and cooperation in your work or school environment and can make distributing information easier for everyone. Our Standard Aluminium Noticeboard is the perfect general option for posting all of your notices. It has a heavy duty aluminium frame and smooth felt fabric that comes in 7 colour options. If you need a more controlled space for posting information, the Tamper Proof Aluminium Noticeboard has a shatter-proof clear glazing panel that locks. The Workplace Depot also has a Wood Framed Noticeboard that comes in either light oak or beech for a more classic look. If you’re looking for something slim set secure, the Metropolitan Acrylic Sliding Door Noticeboard might be your answer. It has lockable, sliding doors made of shatterproof acrylic. It looks professional and will keep your notices safe. The Floor Standing Display Boards are a good option for those looking for more convenience. These are available in 4 sizes with optional header panels, and can be transported with the optional carry case or cloth carry bag – excellent for on-the-go presentations, talks, and lectures. 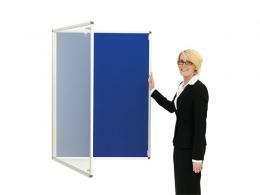 Another free standing option is the Mobile Noticeboard, which comes on locking castors so it can be wheeled anywhere. This model is also double-sided for extra space. 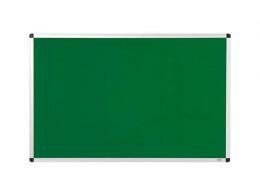 For an additional display option, consider purchasing the Document Display Pockets, which are plastic and attach to any whiteboard or noticeboard. 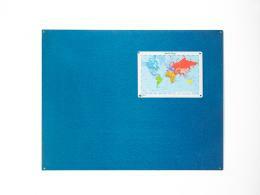 Slip important papers or documents into these to easily showcase them on your board. 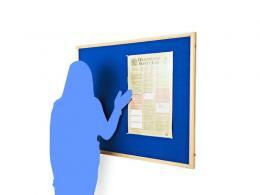 The Workplace Depot offers free delivery on all noticeboards and display boards. These also come with a one year warranty that includes parts and labour. Order today and outfit your office, school, or workspace with practicality.